Low Gap Loop. Morgan-Monroe State Forest. Closest backpack to Indianapolis. Good 10-mile beginner backpack, or easy trip for all weather. Plan to camp in Back Country Area (camping unrestricted; no permits required). This area is south of Low Gap Rd. The CCC-planted erosion-control pine forest is a favorite, south of the climb over Gorley Knob. As well as a forest floor of soft pine needles, it offers clear water from the creek that can easily be purified. 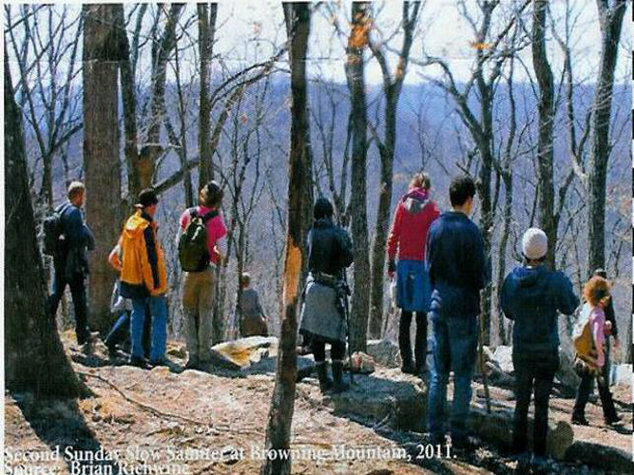 Explore forested ridges and hollows abandoned by settlers, preserved like wilderness 1980s—2004. Note: streams dry up in July; water returns by September or October in most years. Park at the Forest Road Low Gap Trailhead on Landrum Ridge in the Morgan-Monroe State Forest. Exit east off SR37 to the MMSF, 4 miles S. of Martinsville, 25 miles S. of Interstate 465. (You may start at other parking lots along Forest Rd. or on Low Gap Rd. ; consult TT map or MMSF property map). When I69 closes this interchange on US37, follow new route to Forest Road. Note: the parking lot is often full. Not to worry; this is a very popular day hiking and running trail. Google map for Forest Road/Landrum Ridge Trailhead. Tecumseh Trail. 34 Miles south of Indianapolis via US 37. 42-mile trail, one-way, to the Monroe Reservoir, with shuttle. Experience the way the ridge system works at the northern end of the Knobstone escarpment, named in this area the “Martinsville Hills.” The trail crosses many hollows (“Hoosier” for “valley,”) and ridges, and runs along many others. The Back Country area (Mile 5.4—8.4) was set aside for the state equivalent of wilderness in the 1980s. If this status prevails, over the coming century, these trees could begin to grow to their full mature height—the definition of virgin forest. The historic process of forest clearing/harvesting began in the 1800s. A tanning pond on the right and daffodils growing along the trail in this proto wilderness, just before Richards Road (mile 11.8), still remain from pioneer homestead sites. Pine forests in the next section are remnants of trees planted in the 1930s by young men in the Depression-era Civilian Conservation Corps. The trees were planted on abandoned hill farms, to hold the soil. Four Hoosier counties had more than 90% of their lands totally destroyed by sheet erosion. Good distance views of the lengthy Beanblossom Creek valley at Mile 18.9, and all along the way in creek bottom lands. The quiet and views from the trail along Yellowwood Lake will be memorable, as well as the lake view from High King hill at Mile 30.4. A short detour to T.C. Steel State Historic Site is now open and blazed, starting about Mile 38. The site contains Steele’s home, a gallery of his paintings, and elaborate gardens in season. The TT makes for a good 3 day trip for an experienced hiker. Try Day 1 to Foxes Den shelter (13.9 miles), Day 2 to the head of Yellowwood Lake (28.1 miles), Day 3 to the Crooked Creek Rd. parking lot and Trailhead sign (39.7 miles). Water resources for filtering for camping use: there is a creek near the shelter, or water could be cached at the Richards Road crossing at mile 11.8; Yellowwood Lake is clear and drains an area with minimal development and only one (dirt) road. Foxes Den Shelter is open on a first-come, first-served basis. Check the KHTA website for a detailed TT Guide. In spring, water is available near other permitted camping areas along the trail, making for greater flexibility in trip planning. Completed in 2001, the TT was the inspiration of MF-YSF property manager Jim Allen, following a DNR project in 1995-6 to draft plans to extend the original Knobstone Trail to MM/YSF. Trail design and building was directed by Suzanne Mittenthal, as a DNR employee and director of the Hoosier Hikers Council. Park as for the Low Gap loop Day Hike on Forest Road/Landrum Ridge in Morgan-Monroe/Yellowwood State Forest, or at the MMSF office. The end of the trail is about 2 miles in from a parking lot on Crooked Creek Road. This can be accessed via T.C. Steele Rd., from SR 46 at Belmont, midway between Bloomington and Nashville. T.C. Steele Rd. leads down to the reservoir, where it connects to Crooked Creek Rd. Follow that a little more than a mile to the lot, with TT sign. 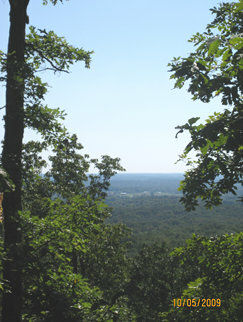 The view from Browning Hill (known locally as Browning Mountain) of the vast Salt Creek Valley is iconic for the northern Section of the Hoosier National Forest. It can be reached from Story, south of Nashville–follow directions for the Nebo Trail. The planned route for the KHT will extend from the end of the Tecumseh via a pioneer track on Miller Ridge down to the de-commissioned bridge over Salt Creek near the foot of Browning Hill, then up the hill on an old haul road. Begin on the HNF bike/hike Nebo Trail. At about Mile 1.2 the trail joins an old road bed. Turn right (east) on this well-used track, departing from the Nebo Trail. Soon the path comes out to a wide path on recently closed county dirt road (there’s a USGS brass benchmark on your left here). Pass the road straight onto wide track on the ridge known as Browning Hill, shown on the topo map. Stay on the ridge 1 mi. to its end and a great view (photo above left). Look for signs that these rocks were blasted from the bluff years ago, presumably for homestead foundations, whose remains can be seen in the area. Good pond water here for a camp near the big rocks. 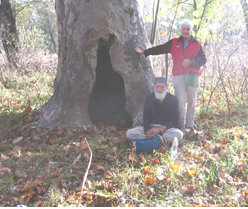 The unimproved 3-mile trail from the viewpoint bluff out to the end of Browning ridge leads to one of the biggest hollow sycamores in Indiana (photo right). Native rocky bluff wildlife includes timber rattlers (photo left: rattler in defensive strike mode). The trail is tricky but very rewarding. Several times tracks leading off knobs are misleading—or the track is not visible. The trick is to keep bearing to the right, sometimes avoiding the obvious—except for the last knob, where the second from the right will help you avoid an inlet near the end you don’t want to bother with. The hollow sycamore can be located near the river bank at the confluence of the Middle and South forks of Salt Creek, about 200 yards to the left of a small channel or cleft in the bank. Best time to visit: early spring for view of Salt Creek valley and dogwoods. Note: the old Sycamore is likely to be under water at this time. Autumn colors are grand, but block the view from the big rock bluff. Views of the valley are available from the trail out to the Sycamore at the tip of the ridge, which should be dry by September. Sunsets from camp or the rocks are lovely any time of the year. Google map for Story/Nebo Trail HNF Trailhead. Best views, and steepest terrain in southern end. Easier N to S. The Indiana State Department of Natural Resources Division of Outdoor Recreation website offers a great deal of useful information about the trail. Try 4 days: Spurgeon Trailhead Mi 43 to Elk Creek Lake—Mi 32; then to creek at Mi.21; then water near Mi 11; then storm-scarred final section—but with some other very fine views (photo right) and down to Deam Lake. A [shuttle] makes this a lot simpler. Water is only available in lakes and ponds along the way. If it looks like soup, just boil it and add potatoes! Prepare to cache water in gallon jugs near roads or purify water along the way in late July, August, and into September. There are many small lakes and wildlife ponds near the trail. There are significant differences between the sections; basically, you will be experiencing the effects of the Wisconsin glacier, which ended in Southern Indiana 10,000 years ago. You will be traveling from areas with better soil for indigenous peoples and settlers resulting from glacial deposits southward to areas whose steep slopes were only scoured of decent soil and impoverished by glacial melt runoff. Start at Spurgeon Hollow, and continue through the Oxley Memorial Trailhead to Elk Creek Lake. You will travel through successional forest resulting from total clearance of all ridges and valley bottoms for farming, plus grazing of hillsides, beginning in the early 1800s. One of the main signs of pioneer settlement: the deep “Vs” of old roads cut into hillsides and ridge ends in wet times of the year by wagons and horses. Logging continues to produce new successional forest types here, where mature trees are cut and younger ones are left for harvesting later. None are left to reach their true potential height, girth, and age. Elk Creek to Leota provides more challenges from the terrain. The trail wraps around Elk Creek Lake and then rises to a fine view of the lake. Then, it follows a very twisting route along the escarpment, rising to knobs and dropping into valleys almost every mile along the way. At the end you will note a big rise to the next trailhead at Leota. From Leota on your way to New Chapel you will enjoy some couple-mile long jaunts on top of those ridges, plus a very green walk amongst the pawpaws along the North Branch of Big Ox Bow Creek before reaching the next trailhead. The New Chapel Trailhead south to the Jackson Road Trailhead provides marvelous walks on forested ridges containing the amazing variety of species characterizing mid-western forests. But on many of these, when you find stretches with pines, planted by the CCC or native Virginia pines, or the chestnut oaks, look down at the soil. There’s nothing there you could grow a carrot in, let alone a field of corn—gone when the ridge tops were cleared for agriculture 150 years ago and all the topsoil was washed off. Notice the “wavy” ups and downs in some trails? Look sideways uphill: these trail waves cross erosion gullies produced by vertical farms. But it’s beautiful hiking today…. Also be prepared to exercise extreme caution when ascending eroded stairs at the SR 160 road crossing just before Mile 11. Nature proves just as tough on the landscape. After passing through these forested acres, prepare yourself for the devastation of the 2011 tornado along the trail (photo at right of Round Knob in 2014). The tornado denuded the landscape of forest for miles around, including those between Miles 7–5. 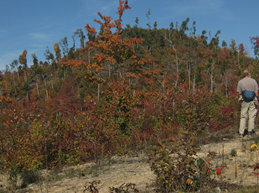 This section contains the most diverse rock bluff knobs of the whole trail, with distance views to all the way to Louisville. It will be a rewarding experience to revisit it regularly for years to come to observe the recovery process. The last 5 miles, from the Jackson Road Trailhead exit to the Deam Lake Trailhead is a short hop, a decompression hike. Watch out; the exit to the Jackson Road Trailhead has no sign, and the trail going south is dangerously steep up to the road. Follow directions for the Spurgeon Hollow Knobstone Trail day hike to Mile 43. Google map for Spurgeon Hollow Trailhead. Directions to the Deam Lake trailhead until after logging operations are completed some time in 2016: from Interstate 65, take Exit 16 (Memphis). Go west on Memphis-Blue Lick Rd. 2.2 miles and turn left on Bartle Knob Rd. Go 2.8 miles to intersection of Beyl and Mountain Grove roads. Go left on Beyl Rd. Follow Beyl Rd 2.7 miles to Crone Rd. Go right on Crone Rd. for one mile. Go right on Cummins Rd. for 1.3 miles. Go right at T-intersection to Wilson Switch Rd. Turn left on Wilson Switch Rd. for 0.8 mile. Parking lot on the right hand side of the road. You will be sharing the trail at first with horse riders. Google map for Deam Lake Trailhead.